The theme of the 7th International Conference put on by the Institute for Research in Metapsychology [now Applied Metapsychology International] in 1993 was “Caring for the World: the Mind is the First Environment.” In his plenary address, Dr. Gerbode spoke on that theme. In speaking to you today, my purpose is to explain what I mean when I say the mind is part of the environment, and why I call it the first environment. During the course of this talk, I hope to prove to you that objects in the physical world are not entirely “out there”, and that on the other hand mental things are not really “inside” either. That might seem confusing, but I hope it will become clear by the end of this talk. The main point is that first kind of environmental cleanup a person’s world needs is a cleanup of mental toxic waste. I will be talking a little bit about what kind of waste that is and what needs to be done to clean it up. As I have mentioned on other occasions, the field of psychology is a Tower of Babel, a confusing mélange of differing theories and terminologies. Helping professionals simply do not agree with each other, as I was shocked to discover during my medical and psychiatric training. After departing that scene and getting into several wild and wooly non-mainstream theories and practices, I came to the conclusion that what we really need is a way of looking at the mind and human nature that everybody can agree on. We need some sort of consensus, and for this we need a minimalist approach. We need to see what we cannot go through life without agreeing is true. The search for that theoretical bottom line took me right back to Descartes. As you know, Descartes said, “I think; therefore I am,” but you can’t go through life being quite that minimalist. There are many other things you must believe in order to live, so you might as well just accept them and include them in your minimalist view. I know, then, that I exist, but I also know that there is a world in which I exist. Not only that, I experience that world and there are others that experience it as well. It isn’t really possible to go through life without believing in the existence of other people, although some people try. It’s no fun, anyway. So I assume that each person has a world of experience that is similar to mine in many fundamental ways and different in other ways. To be really minimalist, however, you have to avoid talking about things like Objective Truth and Absolute Truth. You can’t take the omniscient observer viewpoint, mainly because you aren’t omniscient! All you have is your own viewpoint and your own individual experiences; that’s all any of us has. That’s what we call the person-centered viewpoint: the viewpoint of an individual person looking from where one is, out at the world that one is in at that moment. In Applied Metapsychology, we only deal with what a person can be aware of for him or herself. Even from that viewpoint, we find that there are many things in common amongst different people: many elements of experience, and rules and laws by which these elements are related. The study of all of this is the field known as “metapsychology“. The proper pursuit of Applied Metapsychology requires that we first engage in a very careful definition of terms. Much confusion in talking about experience exists simply because people have been very lax in defining their terms. In our work, we try to define each term very precisely so we all know exactly what we are talking about. We do not look at behavior, physiology, or neurochemistry; we look at experience. Today, from time to time, you will find me slipping into the first person and talking about my own experience. In doing so, I will be operating in accordance with the metapsychological viewpoint, and I invite you to look at your own experience and see if it parallels my own. If it doesn’t, too bad! [Audience laughs.] But I think you’ll find that it does. First of all, how do I experience myself? That’s a trick question really because the correct answer to it is actually: “I don’t!” One doesn’t experience oneself. One is sort of a hole, a blind spot in one’s own field of vision. I cannot see myself because I am the one who is doing the seeing. I cannot be aware of myself because I’m the one that’s aware. This is a peculiar thing: I am always that which is aware, never that which I am aware of. Everything in my experience – even the concept of myself – is not me. I’m not going to dwell on this point or try to prove it to you. I’m just going to state it dogmatically as an example of one part of metapsychology theory. I am none of these things; I am not an entity. But on the positive side, I do know one thing about myself. That is that I’m capable of acting on my world of experience. I can engage in a certain number of basic actions. Thinking is one of them. This was Descartes’ contribution: because I can perform the basic action known as thinking, I must exist. Perception is another. Obviously, “I perceive; therefore I am,” would also prove I exist, as would: “I understand; therefore I am.” Thinking, understanding, and perceiving are three of the basic actions that a person can perform, and every one of us performs all of these actions more or less continuously. From the person-centered viewpoint then, there is (1) a person, and (2) that person’s world of experience. The person is the one who acts and who assumes and sheds (takes on and puts off) identities from which to act, and the world consists of the environment that surrounds that person while he or she is being a certain identity. The only way I can really think about or define myself is as “that which does what I do.” My environment then is everything I can act upon. What can I act upon? First of all, I can act on the physical world. I can, for instance, hit this podium. I can also act on my body: I can move it around and make it do things. And… I can act on my mind: I can think thoughts, look at mental images, and so forth. All of the things I am acting upon must be outside of me, because I am something else that is acting on them. To make this point a little more strongly, let’s take a look at the anatomy of an action, any action. An action is rather like a rod that extends between me and something in my world that I am acting upon. Since we are talking about environmental things, let’s give as an example the action of using my body to pick up a piece of litter. That action lies between me and the piece of litter. As the picker-upper, I’m at one end of the action; as that which is picked up, the piece of litter is at the other end. The fact that this action is going on separates me from the litter but also connects me to it. An action then does two things: it connects you to the thing in your world that you acting on, but it also separates you from that same thing. You are at one end of the action and it’s at the other end. Right next to you at your end of the action is your intention, which is that part of your action that’s closest to you. Then the action extends out from the intention through your mind and your body toward the physical world until it touches the thing that you’re acting on (in this case, the piece of litter) and in so doing, it connects you to that thing but also separates you from it. In what way are we separate from the things in our universe? Are we separate physically, and are we therefore physical objects that are separated from those things? I maintain that it is a different kind of separateness. We are accustomed to thinking of the world as having four dimensions: height, width, depth, and time. Time is a fourth dimension that can separate things even if the other three dimensions are the same, and that is also true of each of the three spatial dimensions for events that happen at the same time. People think of the mind as a completely separate universe of its own, but in fact the mind contains the same four dimensions as does the physical universe. It doesn’t have a different set of four dimensions. As an exercise to illustrate this point, let me have you close your eyes and get a picture of a horse. Mentally move the horse from left to right…up and down… and in and out… then open your eyes. Although that horse was entirely in your mind and not in the physical world, when you moved it left and right, up and down, and in and out, you were using the same “left”, “right”, “up”, “down”, “in”, and “out” as you had after you opened your eyes. It’s not a different right and a different left, etc. Furthermore, it’s the same time dimension, because now that you’ve opened your eyes and you’re looking – presumably attentively – at me, you will observe that first you looked at the horse mentally and then you looked at me physically. Both actions, the mental one and the physical one, lie along the same time dimension. The mental horse then occupies the same time and space continuum as does this podium. That’s a curious thing about the mind. What’s different about it then? In what way are mental things separate from physical things? To answer this question, let’s do another experiment: with your eyes open, imagine a horse galloping right through this podium. Clearly, your mental horse is in the same space and time as the podium. Yet it seems to be separate in some obvious way. If it is separate, it must be separate in some dimension other than the four in which we have already seen it is not separate. This dimension is a fifth dimension in our experience, one which separates mental from physical, subjective from objective. In fact then everything in my universe is located somewhere in five dimensions, not four. We have an ability which in psychology is called “projection”: the ability to take a mental object and project it onto a physical one. Sometimes in fact we get confused and we forget that there is a fifth-dimensional separation. We think then that the mental entity is actually in the physical object. For instance, when you’re looking at your boyfriend, you might project onto him a mental picture of the way your father appeared to you when you were four years old. The two images become confused because you lose sight of the fact that there’s a separation in the mental/physical dimension between the mental picture of the father and the physical boyfriend in front of you. Like any other ability, projection can prove to be a disability when you fail to note that you’re exercising it. 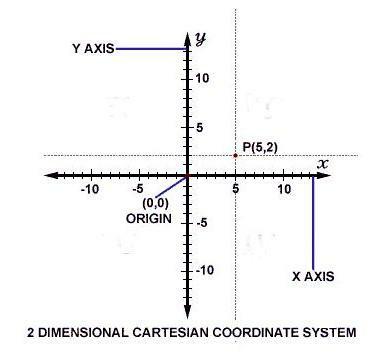 I call this fifth dimension of experience the “polar dimension.” In mathematics, there are two different kinds of coordinates, two different ways of locating things on a graph. 1. Cartesian coordinates. Here we have the familiar X and Y axes. Any point on the graph can be located by specifying a value for X (the distance horizontally from the place where the X and Y axes intersect, called the “origin”) and for Y (the vertical distance from the origin). 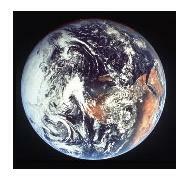 The longitude / latitude system of locating things on earth is a Cartesian system. 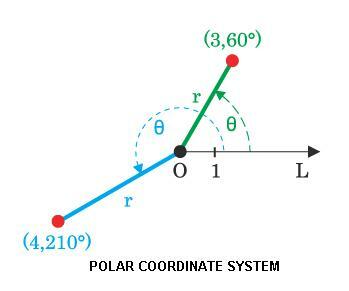 We use the term “polar coordinates” because one measures distances from a point of origin, or “pole” to the point one is trying to locate. This works well for the person-centered approach, because I am at the “origin” or “pole” of my experience and everything is a certain distance away, in a certain direction. Distance along the polar dimension then extends from me towards every object in my world, going out in different directions. We can therefore locate something in space and time and then also locate it by how far it is away from us in this polar dimension. With these five data, we can locate exactly where an object is in our experience. The polar dimension is also “polar” in another sense: as we have seen, a person and any object that person is acting upon lie at two opposite poles, two opposite ends of the action. A magnet has two poles, and one can’t have a north pole at one end without having a south pole at the other. Likewise, when you act on an object in your world, that object is at one pole of the action and you are at the other. The dimension that extends between you and that object is this polar dimension I have been speaking about. In other words, when you act you’re acting along this fifth dimension. Causation is flowing from you to the physical world along this fifth dimension, becoming more and more objective and less and less subjective as it gets further away from you. At your end of the action, you start with your intention, which is entirely subjective. Then as you move along into the action, it gets to be more and more objective until you finally get the consequence out in the physical world. The action itself is actually a flow along this polar dimension, which you might also call a “causal dimension”: it’s the dimension along which you cause things. He thought the pineal gland might serve as a link between the two. I’m not sure how he could believe that since the pineal gland is physical and thus entirely in one universe, not between the two. He thought God would ensure that there was a reasonable correspondence between mind and body, because God would not be so mean as to allow the mind to think things about the body that weren’t true of it, and God would perform the service of making things happen in the physical universe when we intended them. Mind then is the first environment because it is the innermost part of a person’s environment (in the polar dimension). The mind is not inside the person, but it is innermost. If an entity is mental, it is therefore close to you the observer, in the polar dimension, as with the image of a horse. It is not way out in the physical universe. It’s closer in. 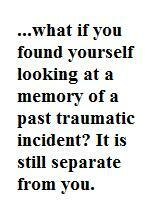 Now instead of an image of a horse, what if you found yourself looking at a memory of a past traumatic incident? It is still separate from you. Such memories are not inside you; they’re not part of you. That is good, because although you cannot be causative with respect to things that you regard as part of you, you can be with respect to things that are outside of you. You can’t act on something that is inside you, because every time you act on something, it is by definition outside of you; your action separates you from that thing. If you take the viewpoint: “Well, this is just part of me,” “I’m just like that,” “It’s just the way I am,” or whatever, it gives you a very ineffectual viewpoint, whereas if you say “This is not part of me… this is something I can perceive… this is something that is outside of me,” it gives you a viewpoint from which you can act. Adopting the viewpoint that the mind is part of one’s environment rather than part of oneself then is empowering. In fact, it is a really crucial way of looking at things. People who fail to make that differentiation with respect to their own past traumatic incidents will tend to identify themselves with the dramatis personae [the characters or actors in a drama] of those incidents. A man, triggered into a traumatic incident, may “become” the way his father was in that incident, and then unconsciously act out that role in the present, having little or no control over his behavior. There’s a form of contamination, pollution if you will, in which a person confuses herself with some identity in which she has become fixed. I will talk a little bit more about that later. The essence of viewing is the action of “stepping back” from and looking at things that the viewer thought were a part of her. You can’t see something when you’re being it. Actually, the very act of looking is all that is necessary in order to step back from something. When you get people to look, they automatically start to become aware of things that they are not. That is very good, because in that way, they become free from fixed identities of one kind or another. When you step back, in which direction are you stepping? You are actually stepping back in the polar dimension. A person has the basic ability to move back and forth along the polar dimension and does so when he assumes and sheds identities. In assuming an identity, he steps forward into it; in shedding one, he steps back out of it. Sometimes, he can be being the body, and sometimes he can be being something else. Sometimes he can be something on the subjective side of the mind that can look at mental pictures. Viewing then has a great deal to do with personal identity and has a major effect on one’s view of one’s own personal identity. I mentioned towards the beginning of this talk that people characteristically have the ability to do things, to act. But we also have the ability to assume and shed identities, to be different things at different times, and having an identity provides the means of acting. Whenever I commit to a particular activity such as playing a piece of music, I formulate an intention. First I decide to play that piece, and then I assume an identity that can fulfill that intention: that of a lutenist [lute player]. I take my lute out of its case; find music, and a music stand, a suitable chair and footstool. If I get really inspired, I might even put on Renaissance clothing. And I bring to mind all of my knowledge about music and about the piece I am playing. In that way, I assume the identity of a lutenist. What exactly is an identity? It is simple a package of knowledge, ideas, characteristics, tools, skills, and abilities that one can incorporate as part of oneself for a period of time in order to perform a particular task. Each identity is ruled by the intention that caused one to put on the identity in the first place. The intention actually comes first and is more important. In practice however, intention and identity are inextricable because forming an intention and assuming an identity occur at more or less the same time. Right now, for instance, I’m in the identity of a lecturer, so I’m not acting the way I normally act. I’m standing here, talking in a relatively loud voice, and I have my notes in front of me as helpful tools. But if I start thinking about how I’m doing as a lecturer, how well I am coming across, whether I am using the right words, and whether my material is organized correctly, I’m not going to be a lecturer anymore. The minute I put my attention on my lecturer identity, I become a critic… a student… a lecture preparer… or something else, but I cease to be a lecturer. When you examine an identity, you don’t introspect. You step back from it, come out of it, and look at it from further back along the polar dimension. You step back in that direction and look outward toward the position you previously occupied. And from that vantage point, you see the identity as something outside yourself. If for some reason you can’t step back from an identity, then you’re in trouble. You’re in a fixed identity you can’t get out of. And if you can’t step into an identity, you’re also at a disadvantage. The idea then is to be able to step into or out of identities at will without getting stuck in or out of any of them. There’s a thing I used to call the “great man syndrome” (but now call the “great person syndrome”): when a person has been a “great person” for awhile and has found it to be a successful thing to be – an identity for which she gets a great deal of admiration, such as that of a “great doctor” – she may start feeling unsafe or insecure being anything else. So when she goes home at night, she doesn’t shed that identity and instead of having a pleasant informal dinner and evening, the family has “grand rounds” with the Chief of Surgery. It is in fact necessary to let go of an identity when you finish the activity it governs, just as when you finish a job it is time to put your tools down and do something else. If you’re always carrying all your tools around everywhere it gets to be cumbersome. Letting go of identities is the personal ability called “humility”. It’s wonderful to be a “great person” when it’s appropriate, but it’s also good to be able to turn it off when it is no longer appropriate and become something else: a lover, a parent, a friend, or whatever may befit another time. Besides being stuck in an inappropriate identity, people can also have the problem of being unable to step into and take responsibility for a larger identity, when necessary. That is a problem that might be called “cowardice”. A coward is too scared to actually step into and assume an identity because he is afraid of the responsibility, afraid of being hurt, or whatever. Ideally you are versatile: you have an extensive repertoire of identities that you can step into and out of freely at any time, without getting stuck in any of them. Education: You acquire an identity by education and training. You learn how to be a doctor by getting medical training and then you can step into the identity of being a doctor. If you didn’t go to medical school, then you wouldn’t have that identity to step into. Courage: If you lack courage, you will allow fear to prevent you from extending yourself into an identity and asserting it. Humility: In order not to be stuck in an identity you must have the willingness and ability to be something simpler and less extended. Humility also allows for relearning and improving one’s skill. People who are stuck in a particular identity are stuck with the skills that they have. In order to acquire better skills as a certain identity, you must be able to step back from that identity, look at it, revamp the skills, and then step back into it with greater skills. I would like here to make a little excursion into the Buddhist concept of non-attachment. Buddhism is the religion I admire most, partly perhaps because it’s the least religious of religions, but also because it makes sense. As I understand it, Buddhists have the idea that attachment causes all human pain and suffering. If you crave something and then you don’t get it, you are going to feel pain. A craving is really just a fixed intention, one you can’t let go of. If you have a fixed intention, then even when things begin to go sour, you can’t give it up. You experience increasingly intense and negative emotions about it, as your failure becomes more and more apparent. You start feeling angry, then anxious, then sorrowful, and so you ride the Emotional Scale all the way down to the bottom, because you can’t let go even when things are going really badly. If you are versatile and can let go of intentions and identities when it is appropriate to do so, you can just say, “Well, I don’t have to do that anymore. There are lots of other things I can do.” You don’t feel compelled then to have that intention and you don’t feel stuck in that identity. Buddhists and others sometimes talk about “letting go of the ego.” An “ego” is just a fixed identity. A person may actually have several different egos. I could have an ego as a guitar player, but I might have another ego as a philosopher or something else I’m stuck in and thus unable to examine or criticize. “Letting go of the ego” then means simply having the humility not to be various things. Ideally, one could simply be nothing in particular, or be something very simple, but ideally one would also have the ability to be many things at will. One cause of fixed identity is confusion about what one is and what one is not. To get back to mental pollution: one’s mental environment is polluted to the degree that one is stuck in various parts of it and unable to extricate oneself from it. Since mental entities are those which are closer to the person on the polar dimension, they are the things with which one most easily confuses oneself. People may not always be the wonderful identities that they can assume, but they are also not whatever mental pollution surrounds them. People can have flaws without being flawed. Flaws are external to a person; they are problems with one’s environment. This is something I like to tell clients: “You are not the mental crud that surrounds you. That is outside of you. That is part of the environment. There is nothing wrong with you, the person. You are perfect.” This is something I hold as an article of faith, but it’s also what I’ve discovered from experience: people are essentially perfect. Our goal in working with clients – “viewers”, as we call them – is not to change them and make them more nearly perfect. The viewer is already perfect without having to be anything in particular. Our goal, rather, is to help viewers improve the quality of their mental environments. When they do so, their physical environments will thereafter improve. Humility then is not thinking that one is a bad person, imperfect, or a miserable sinner. Humility is realizing that one is perfect exactly the way one is and that one does not have to be any particular identity in order to be perfect. Knowing that, one can easily let go of identities. Humility thus reflects a positive attitude towards oneself, not a negative one. I don’t have to be any particular thing because I’m OK the way I am. I don’t have to assert any particular identity; I don’t have to be a “great person”. Courage is based on the same premise: one is willing to take on an identity and a task at which one might fail because one knows that ultimately one is innately perfect anyway, so if a particular identity one has assumed is failing, one can always step back from it and be one’s perfect self, and then step forward into some other identity. If you’re not stuck in and over-identified with a particular identity, then you’re more willing to take it on because there’s not that risk of “dying” as that identity and being upset about it. Let’s just talk briefly about what kind of mental pollution surrounds a person. Although a person is perfect in himself, he has a monumental task of environmental cleanup on his hands, and this process has to happen from the inside out. If you have a job to do and some tools to do it with, but your tools are in bad condition: if they’re corroded, broken, dirty, scattered, or disorganized, you’re not going to be able to do the job well until you clean up the tools. If you look at the polar dimension again you will see that tools are always closer to you than the things you’re using the tools to act on. Your overall strategy then should be to start with things that are closer to you and then move to things that are farther away. What are people really trying to accomplish in life? I’m going to answer that question quite dogmatically and hope that you will be able to relate what I am saying to your own experience. To have a world that is maximally empowering. Drive: the capacity to want. Drive is a lust for life. To be powerful, you’ve got to be able to want things strongly. Control: your capacity to make things happen. To be powerful, you need to have some control over your environment. Understanding: the capacity to acquire knowledge. Drive and control without understanding doesn’t lead to power, but to destruction. 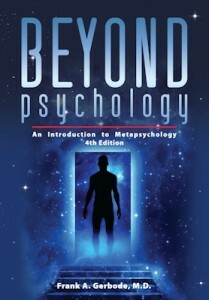 Beyond Psychology: An Introduction to Metapsychology, 4th Ed. I won’t try just now to convince you of the above. That’s another lecture or you can read about it in my book, Beyond Psychology: An Introduction to Metapsychology. Corresponding to personal power, which is on the person side of the person-world polarity, is empowerment, that quality our world has that assists us in being powerful. Empowerment also consists of three parts, corresponding to the three parts of power. Pleasure: relief from pain, aesthetics, and simple positive enjoyable things, like ice cream. Pleasure corresponds to drive, which I have defined as “the capacity to want”. We desire things that we find pleasurable. It is the fact that things are pleasurable that causes us to desire them. Order: congruity, simplicity, and stability. This corresponds to control. We can control things that are orderly. Heuristics: the quality of the world that permits us to learn from it. (I use “heuristics” just because I can’t think of another word that conveys the correct meaning.) We want our world to be something we can learn from; we want life to be interesting: a learning experience. Such a world promotes understanding. The more heuristic our world is the better capacity we have to understand it. The more orderly the world is, the better capacity we have to control it, and the more pleasurable the world is, the more capacity we have to desire it and the things it contains. What are unwanted are instances of frustrations of these three basic parts of the power triad. This is the mental pollution we want to get rid of. The things that get in the way of pleasure and cause us not to want things are negative feelings, unwanted emotions, pain, and uncomfortable feelings. The things that frustrate our understanding are cognitive distortions, delusions, and fixed ideas. The things that frustrate our urge to have control and order are destructive behaviors, compulsions, inhibitions, and maladaptive actions. Each of these is unwanted because it’s a frustration of one of the three parts of the power triad. These are the things that are resolved in viewing. I would like for a minute to talk about viewing and to differentiate the skill of viewing from that of facilitating, because the two are quite different. We use the term “viewer” to refer to one who is receiving the help and “facilitator” refers to the one who is helping. We prefer to use those terms rather than “therapist” and “patient”. The facilitator is rather like an operating room nurse, and the viewer is like the surgeon who actually performs the operation. A good operating room nurse has things really organized. She has everything in proper sequence to hand to the surgeon. Similarly, the facilitator always has a pending question that the viewer is answering. The facilitator, like the nurse, has the skill always to know when things are not going well, and she has tools available to hand to the viewer so that the viewer can handle the situation. Cutting through the layers of delusion and looking honestly at things; confronting difficult issues and not shying away from them. Recognizing a point of resolution (an “end point”) when one occurs. Avoiding automatically interpreting or invalidating his own perceptions. At the beginning, when a viewer sees something, he often says things to himself like: “Oh no! It can’t be that way! That can’t be right!” He needs to learn to stop doing that and simply to perceive what he perceives. When he does that, viewing starts going much faster and more easily. Noticing when he is preoccupied with or disturbed by something and unable to put his attention on the current session agenda. So there is skill involved in being a viewer, and one does not become a full-fledged viewer the first time one steps into a session. Life Stress Reduction, which is a whole program of actions taken to address all the issues: upsets, worries, unwanted feelings, relationship problems, self esteem problems, etc., that a viewer currently, chronically has attention on. Discovery. Once you have done the immediate cleanup, you can start looking for other things to clean up, and that’s the discovery phase. That’s where you go out into your backyard and start looking around for pieces of paper and cleaning them up. Self-Realization. Finally, once you’ve cleaned up your own mental space you can start addressing matters having to do with your ultimate aspirations, whether these be spiritual or material. Upsets: When one has an upset with somebody such as a sudden loss of affection, one experiences a negative feeling about that person. Worries: When one’s attention is engaged in trying to solve a current worry, trying to put attention on some other area without first cleaning up the worry can be counter-productive. Withheld Communications: When one has failed to communicate certain things to others, one feels upset because one has gone against the natural urge all people have to communicate and achieve communion [used here not in a religious sense, but in the sense of connection and interchange] with others. Misdeeds: When one has harmed others, one feels upset for similar reasons. Triggered traumatic incidents: One can also get uncomfortable feelings when a traumatic incident gets triggered or reactivated, and one then has to re-experience the negativity it contains. Disturbances are the “sacks of garbage” that people trip over initially if they don’t handle them. When a person comes to her first viewing session, she has usually failed to differentiate herself from a good part of the mess we call the “Traumatic Incident Network” or “Net”. Because she is immersed in certain parts of the Net, she cannot look at them and remains unaware of them. All she can perceive is that which lies outside (along the polar dimension) the material she is being. All she can see initially is the periphery of the Net, which consists of disturbances, because she is being the deeper parts of the Net, including her traumatic incidents. Disturbances therefore are what a viewer has to deal with first. In Life Stress Reduction, you mainly do clearing up of disturbances: incidents and issues that are immediately impinging on the viewer. You clear up all current disturbances, but the viewer still has ample potential for accumulating more. During the Applied Metapsychology Ability Enhancement Curriculum, you do a thoroughgoing discovery: a cleanup of those factors that make the person prone to the various kinds of disturbances. When disturbances have received this kind of “deep cleaning”, the viewer can now step back from and become aware of the traumatic incidents that underlie the disturbances, and now you do a very thorough job of Traumatic Incident Reduction. After this phase of General TIR and after completion of the viewing Curriculum, you can choose to work on greater self actualization in the Advanced, or Graduate material. One of the things you do at this point is to pursue the Buddhist line by addressing craving and attachment: the fixed intentions and identities that lie at the core of the net. Frustration of fixed intentions (“cravings”) causes the pain that traumatic incidents contain. That in fact is what makes traumatic incidents traumatic. If you can address and eliminate fixed intentions, then the viewer will have a greatly reduced propensity for developing traumatic incidents, whether past or future. Once you have cleaned up your mental space, you are in a position to go out deep into the world and handle your physical environment. Or if you’re a facilitator, you can help other people handle their mental space. In either case, as you handle disorder, pain, and mental cloudiness (debilitation), you make the environment more orderly, pleasant, and aesthetic, and your ability to learn is also enhanced (thereby bringing into being a more empowering world and acquiring greater personal power). Although I have said that people are deeply motivated to have a world that is empowering to them and also to be powerful, that isn’t really the highest motivation. The highest motivation is towards relating to other people. This is the urge towards what I call “communion”. Communion is a triad of communication, affection, and experiential sharing. Communion is the real payoff in life. When you can commune with others to a high degree, you are fulfilled in life. From this viewpoint, a clean and ecologically sound environment is good, but not the highest good. Why should we have a clean environment? We are we concerned about the environment? First of all, because we are concerned about survival. We are not going to survive on this planet if we have poisoned it. Besides, things like pollution, ugliness, and disharmony provide a major distraction to our primary activity, that of relating to other people. It’s easier to share a world if the world you’re sharing is beautiful, harmonious, and interesting. All of the care with which we plan to improve our environment and to maximize its order, beauty, and wonder only serves to set the stage for the main event: the living drama and celebration of communication, life, and love.